Tricia's Take: OOTD- I am not a Sailor, but I might be a home owner soon! OOTD- I am not a Sailor, but I might be a home owner soon! Here is a picture of our house *almost* we changed the outside a bit by making it two different shades of grey, adding more stone and making it a 3 car garage. We also are building on a hill and have an amazing view of the valley, which gives us a walk-out basement. I am so excited and will show you pictures of the progress as it happens! It will have 5 finished bedrooms and 3 full bathrooms, ahhhh room to put all my crap! I cannot wait to join the club and finally become a homeowner!! congratulations! That must be so exciting! I'm sure your views will be outrageous - I've never been to Utah but it always looks so pretty in pictures! The house is amazing, Tricia! I bet you are going to have it fixed up so cute. Enjoy the process. It can be so much fun!! I'm so happy for you! Congratulations on your new home!!! It looks beautiful, as do you in your nautical outfit! I am so obsessed with this nautical look. I love it. Beautiful home. I have a 6 bedroom and am selling it to downsize, not sure where I'll put all my stuff in my new house!! LOL!! You look so happy and pretty in the photo. Love those shoes, really, really cute. WOW, I LOVE that house! It's so pretty! My husband dreams of a 3-car garage! =) I can't wait to see pictures....and how exciting that it will be done this summer! Crossing my fingers for you that it all comes together perfectly. 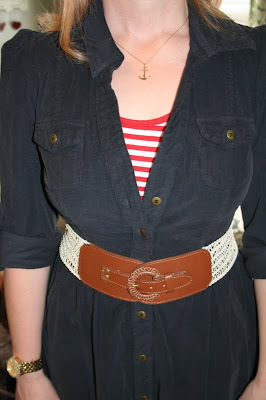 I love the red and white stripes under the cord dress...such a cute mix! You look great! Cute outfit. You are totally making the sailor look grow on me! I am sad you are leaving us, but super excited for you! That house is Amazing! I love the style of it. Ooooo, the new house looks lovely! Your mom's advice is good, too -- after all, home is where your family and loved ones are, so you'll set up a new home in no time. I LOVE this outfit -- I especially love how that little peep of red and white stripes under the dress makes it so much more fun and nautical! Oh my gosh! The shoes are absolutely adorable. Best of luck with the house. It's scary to uproot, but think of all the decorating you get to do! Congrats! Can't wait to see your new house and help decorate it!! 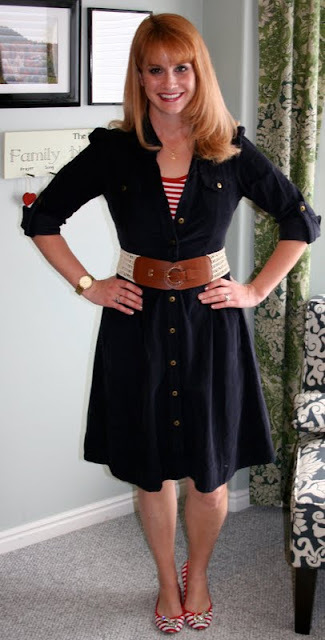 Love the nautical stripes with that dress. love the styling of your Refined Cord! I already packed mine up! Congrats home owner!! How very exciting to build your own place! It is amazing they can do it so fast! Yay!! 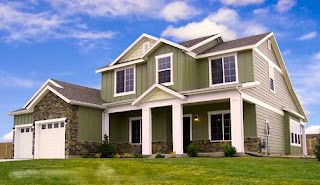 Congrats on your new home...that is so, so exciting!! It is such a relief to know you will finally have room for all of your belongings....and so much fun decorating! I love your shoes! Oooh, Congratulations! How exciting. Decorating is THE best part of moving into a new place. All the possibilities! Congrats! Love your new house...It would be amazing to have all that space! Enjoy, decorating is so fun! And your outfit is cute as a button - when I can fit back into this dress I am totally going to copy with the happy stripes layered underneath - you look adorable! Your house will be gorgeous! It will be fun to see it's progress and how you choose to decorate! It's SO cute!! What part of Utah is it in? Congratulations, and I can't wait to see the process of building, decorating, living over the next year! Pretty outfit! Love the house and cannot wait to see more pics of it! Congrats! Congrats, Tricia! What an exciting accomplishment for you guys. The house looks absolutely gorgeous -- as did you for the paper signing! I love those flats every single time you wear them!